as far back as 1837. The company is considered a symbol of American farmers, ranchers and landowners. very good consumer ratings for the different models. 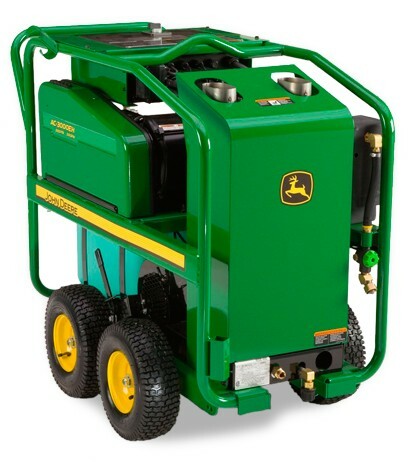 commercial pressure washers as well as hot water washer versions of the same. water tank for offsite cleaning. light duty washer. However, generally in the industry a gas powered pressure washer of 3800 psi and 4.0 GPM in water flow is considered a heavy duty washer suitable for more demanding professional jobs at the commercial or industrial site. According to industry standards this is a professional pressure washer. We consider this model amongst best pressure washers not only because of its very good ratings on the market averaging 4 out of 5 stars but also because of its makeup. It runs on a Honda GX390 OHV engine and has a professional grade Triplex Pump. Even though the best combination of engine and pump is Honda and CAT respectively this machine will still produce great power with a Honda engine. We mention several times across reviews on this site that Honda powered pressure washersare amongst the top rated because of the reputation of Honda engines of being much quieter in operation, easy to start usually starting at first pull and general durability. They are meant to last and many pressure washer owners appreciate that. 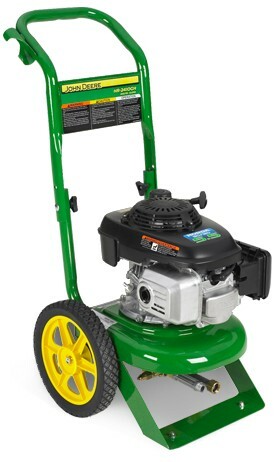 They differ sharply with some Briggs and Stratton pressure washer engines which some owners have complained bitterly about. This model number LP020297 comes as usual with 5 quick connect spray tips including a soap pressure washer nozzle and can even work with a turbo nozzle and a variety of other pressure washer accessories. The low pressure nozzle which is the 5th one meant to apply pressure washer soap or detergents on your work surfaces whilst cleaning. 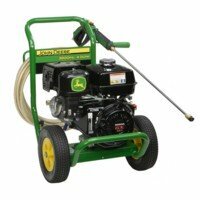 In terms of hose length this John Deere pressure washer has a 50ft long industrial grade steel reinforced non-marking hose. identified PROS and CONS of this model. and certain woods and patio furniture. This is great plus for this unit. Our overall recommendation is that this unit can perform to expectation. However, the pump can be somewhat weak and has led to many disappointments in terms of pressure output. 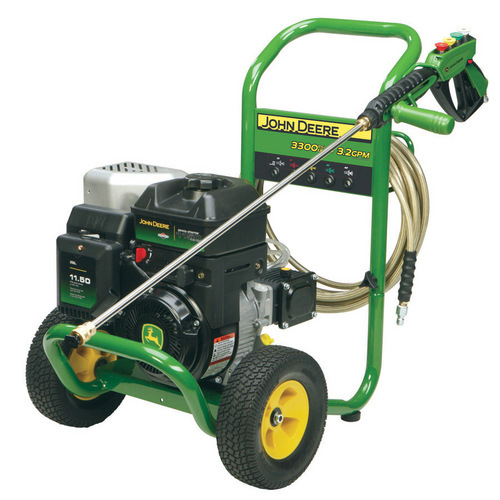 It is for this reason that we think John Deere could have classified this model as a light duty pressure washer at 3800 psi. It costs on average about $1000.00 online. is an 160cc OHC vertical shaft engine. grill, patio, siding with relative easy. Some surfaces might require detergent application for best results. This includes oil and grease stained garage floors. As shown in the picture this unit is mounted on a two wheeled cart for easy of mobility. pressure regulation. Onboard storage of high pressure hose and pressure wand appreciated.